While Google has yet to respond to the letter, or remove the app, it recently joined Apple in “promising to investigate a Saudi app that lets men control women's travel,” according to a recent report. Google should treat Smart Pakem with the same degree of scrutiny. The Religious Freedom Institute (RFI) has relocated its Washington, D.C. office to the heart of Capitol Hill. The new address is 316 Pennsylvania Ave, SE, Suite 501, Washington, D.C. 20003. The Religious Freedom Institute (RFI) welcomes the U.S. Department of State’s recent announcement that it will host a second consecutive Ministerial to Advance Religious Freedom July 16-18, 2019. “We are grateful for Secretary Pompeo’s commitment to advancing religious freedom around the world,” said Thomas Farr, President of RFI and founding Director of the State Department’s Office of International Religious Freedom. January 25, 2018 Washington, D.C. (Religious Freedom Institute) — The Religious Freedom Institute (RFI) commends the U.S. Senate for confirming Governor Sam Brownback as the new U.S Ambassador-at-Large for International Religious Freedom. Religious Freedom Institute President Thomas Farr welcomed the Senate's decision: "Ambassador Brownback's deep experience, and his commitment to religious freedom for all people, will help ensure American leadership in the vital work of reducing global religious persecution. We believe he will make U.S. religious freedom policy an integral part of America's national security strategy." Ambassador Brownback will confront a host of daunting challenges and threats to stability and security. Rising levels of global religious persecution are being fueled by violent religious extremism, oppressive government policies, and aggressively anti-religious forms of secularism. Millions are suffering terrible depredations as a result. Nations and economies are being destabilized by the absence of religious freedom. Ambassador Brownback is the right choice to lead U.S. policy in addressing this global crisis. In his 16 years as a Congressman and U.S. Senator, Brownback built a reputation as a steadfast advocate for religious freedom. He was one of the key supporters of the landmark International Religious Freedom Act of 1998, which established in law the promotion of religious freedom as an element of U.S. foreign policy. The Act also created the ambassadorship Brownback now holds. In the Senate, Brownback played an integral role in increasing and improving the U.S. response to the genocide in Darfur by introducing the legislation that became the Darfur Peace and Accountability Act of 2006. A policy brief released in early 2017 by the Religious Freedom Institute and the Institute for Global Engagement offers recommendations on international religious freedom policy to the Trump administration and Congress. The brief stresses the importance of integrating religious freedom into U.S. foreign policy and national security thinking. The brief notes that by placing religious freedom at the core of our foreign policy "the Trump administration has a remarkable opportunity, at low cost, to make a major contribution to international justice and stability, fundamental human rights, economic growth, and U.S. national security." RFI President Thomas Farr said that "Ambassador Brownback can make this vision a reality and deserves the support of all Americans in achieving it." On Wednesday, December 6, Thomas Farr, President, Religious Freedom Institute, testified before Congress on the ways in which U.S. International Religious Freedom diplomacy can improve our nation’s ability to combat Islamist terror. In short: more religious freedom abroad can help prevent the rise of terrorism and protect Americans here at home. Full testimony: Employing Religious Freedom Diplomacy to Combat Extremism, Thomas F. Farr and hearing video is below. In marking World Human Rights Day (which takes place on December 10th, 2017), the Subcommittee on Africa, Global Health, Global Human Rights, and International Organizations of the House Foreign Affairs Committee held a hearing examining the strategic contribution of human rights to addressing issues of extremism. Other Speakers included: John Lenczowski, Ph.D. (Founder and President, The Institute of World Politics), Sayyid Syeed, Ph.D., (Senior Advisor, Office of Interfaith and Community Alliances Islamic Society of North America), and Mr. Neil Hicks (Director, Human Rights Promotion, Human Rights First). The briefing opened with remarks from Ambassador Michael Kozak, Bureau of Democracy, Human Rights, and Labor, Department of State. It was then followed by a second panel of experts, including, Dr. Daniel Mark, Chairman, U.S. Commission on International Religious Freedom, Dr. Kathleen Collins, Associate Professor of Political Science, University of Minnesota, and Philip Brumley, General Counsel, Jehovah’s Witnesses, Nathaniel Hurd, Policy Advisor, U.S. Helsinki Commission, moderated the event. The full event video is available below. Dr. Collins, a scholar of the Under Caesar's Sword Project, highlighted many of the findings of her research on Christian responses to persecution in Central Asia. Dr. Collins concentrated her time on the evolving situation in Kazakhstan and Kyrgyzstan. She suggested that governments in the region are looking towards each other and Russia to justify extremism laws that are really just another form of religious persecution. Based on her research, the recent actions in Kazakhstan and Kyrgyzstan have taken steps similar to Soviet-era tactics of repression and control of all groups not approved by the government. Societal discrimination continues to be high across the region and remains worth addressing. The Under Caesar's Sword project studied response where Christians face persecution. Predominant strategies in Central Asia represent decades of Soviet-style repression. Primarily they hide and seek to merely survive. For those who seek public engagement they do so with enormous risk. Positive steps have been seen through engagement in humanitarian and social services, filling gaps that government has often overlooked. Ambassador Kozak highlighted the important connections between enhanced security and religious freedom and efforts currently underway at the State Department to advance religious freedom. Dr. Daniel Mark, Chairman of the U.S. Commission on International Religious Freedom, expressed that trends in the region are not encouraging. He said that, "Unfortunately, we at USCIRF are not optimistic with regard to the outlook for religious freedom in the OSCE countries we monitor. Generally speaking, the trend has been toward authoritarian governments imposing more written and unwritten restrictions on expressions of religion." Phillip Brumley, General Counsel, Jehovah’s Witnesses, highlighted particular challenges his community has faced across the region due to government restrictions that have limited their ability to practice their faith. Although federal law has long prohibited unjust coercion of healthcare professionals, current law restricts a healthcare professional’s ability to protect his or her conscience rights. For example, employers have pressured nurses to participate in abortions or risk losing their jobs. The federal Weldon amendment prohibits discrimination against individual or organizational healthcare providers who do not participate in abortions but fails to include a method for them to vindicate this non-discrimination right in federal court. Currently, if a healthcare professional or other healthcare provider is threatened or otherwise suffers discrimination for not participating in an abortion, the only recourse under the Weldon amendment is to file a complaint with the Office of Civil Rights at the Department of Health and Human Services (HHS). In Roe v. Wade (1973) itself, the Supreme Court cited with approval a policy that “neither physician, hospital, nor hospital personnel shall be required to perform any act violative of personally-held moral principles.” The same year, Congress enacted protections for health care professionals’ conscience rights in circumstances involving abortion. In 2004, the Weldon amendment provided additional protections for physicians and nurses – as well as hospitals and other healthcare entities – against discrimination for not performing or participating in abortions. Congresses and Presidents of both parties have approved the Weldon amendment every year since 2004. Congress should act immediately to ensure that nurses and other healthcare professionals are free to vindicate their rights promptly through our justice system. The Religious Freedom Institute urges Congress to protect the religion freedom that enables professionals of all faiths to contribute to our society their much-needed healthcare skills and expertise. October 27, 2017, Washington, D.C. (Religious Freedom Institute) — In recent years considerable confusion has emerged on American college campuses about the meaning and value of religious freedom. Religious belief and expression by Muslim, Jewish, Christian and other religious students have been declared hateful or bigoted. This week the Georgetown University Student Activities Commission announced its intent to examine charges against Love Saxa, a Georgetown student organization that holds and promotes Catholic teachings on marriage and sexuality. A hearing is scheduled for October 30 to determine whether Love Saxa should be defunded and removed as a sanctioned student group at Georgetown. Students at the University have charged that Love Saxa’s promotion of Catholic teachings violates Georgetown Student Organization Standards by sanctioning hatred and intolerance. The Religious Freedom Institute stands for the right of all college students in America, and all student groups on college campuses, to make religion-based arguments about the common good. This right is protected by the First Amendment’s guarantee of the “free exercise” of religion, and is at the core of American democracy. "This is an opportunity for students at Georgetown to break out of the toxic paradigms that increasingly plague our public discourse, and to demonstrate that holding differing views or beliefs must not be viewed as fostering hatred or intolerance," said Abigail Galván, Director of Development for the Religious Freedom Institute, a Georgetown alumna, and a founding member of Love Saxa. "I encourage Georgetown students, as the future leaders of our nation, to promote a full exchange of ideas and do so in an environment where religious freedom is fully embraced and flourishes,” said Galván. The United States was founded on the proposition that religious freedom for all its citizens, protected in law and valued in culture, is necessary for the success of democracy. There are many reasons for its value, including its role in protecting equality and ensuring unity. The Religious Freedom Institute urges all college students, and all Americans, to consider the value of religious freedom in combatting the abandonment of civil discourse in our colleges and universities. Our Constitutional guarantee of the free exercise of religion ensures that all voices, including those grounded in religion, are welcome in America. The Institute also notes that the Constitution guarantees the right of free exercise for religion-based universities, such as Georgetown, which is a Catholic University in the Jesuit tradition. Among other things, this means that such institutions have the right to defend the teachings of the religion which defines their identity, and to offer those teachings to their students. This right extends to all faith-based colleges and universities. While the U.S. has strong principles of religious freedom, and a great diversity of religions have flourished, there have always been struggles in putting principle into practice. Timothy Shah, Senior Director of the Religious Freedom Institute's South and Southeast Asia Action Team, on September 12 delivered a keynote address discussing America's long tradition of religious freedom and religious pluralism with a delegation of senior officials from the Republic of Georgia. The delegation was part of a State-Department funded program which brought senior Georgian religious and military officials to the United States to explore Human Rights and Religious Pluralism in the United States. The goal of the program was to examine best practices in promoting interfaith dialogue, as well as to look into how governments, non-governmental organizations, and faith-based groups promote diverse, tolerant, peaceful communities. In the discussion, Dr. Shah examined the formulation of religious freedom principles such as those enshrined in the First Amendment or expressed in President Washington's letter to the Newport Hebrew Congregation in 1790. He also considered recent trends that demonstrate both growing religious diversity and tensions that have emerged such as anti-Muslim attacks on mosques or hateful rhetoric or anti-Semitic hate crimes. The Religious Freedom Institute in its work, both domestically in the United States and in countries around the world, seeks to bridge the gap between principle and practice to promote religious freedom that leads to the flourishing of all. The National Security Subcommittee of the House Oversight and Government Reform Committee held a hearing to review the U.S. Government's role in advancing International Religious Freedom. The hearing looked back at the impact of international religious freedom policy since the 1998 International Religious Freedom Act, through to the amendment in the 2016 Frank R. Wolf International Religious Freedom Act, and recommendations for how to improve the policy to meet current challenges. RFI President Thomas Farr testified both of the strategic value and moral imperative for promoting religious freedom. It is intimately connected with American national security interests, along with being a vital humanitarian right. In his testimony (full text), Dr. Farr highlighted the need for developing arguments and action plans to effectively engage governments and societies to demonstrate that religious freedom is a strategic good not only for the United States but for every country. Religious freedom has direct links to undermining religion-related terrorism, boosting stability and economic growth, and protecting vulnerable communities. Full Testimony - Dr. Thomas F. Farr: "Religious Freedom and American National Security"
Opening Statement by RFI President Thomas Farr in testimony before the National Security Subcommittee of the House Oversight Committee on October 11, 2017. Kristina Arriaga, Co-Chair, United States Commission on International Religious Freedom, testified of the need for increased resources to implement the tools that exist to target violators of religious freedom. She also highlighted the unjust imprisonment of American Pastor Andrew Brunson who has been held in a Turkish jail for over a year on false charges. Thomas Farr, Religious Freedom Institute, highlighted the connection between effective religious freedom policy and national security concerns and the need for an all-of-government strategy. Kristina Arriaga, United States Commission on International Religious Freedom, highlighted the case of American Pastor Andrew Brunson imprisoned in Turkey along with the situation of Bahai in Iran and other targeted communities. Rob Berschinski, Human Rights First, reflected on the critical role of advancing religious freedom as part of global diplomatic efforts to address instability. Ambassador Michael G. Kozak, Senior Advisor, Department of State highlighted existing efforts to advance religious freedom and previewed new tools that allow greater targeting of non-state actors like the Taliban and ISIS for religious freedom violations. Kent Hill, Executive Director, joined VOA News host Carol Castiel on the Encounter program to discuss the release of the U.S. State Department's 2016 Annual Report on International Religious Freedom and the global challenges to religious freedom around the world. Dr. Hill was joined on the program by Katayoun Kishi, research associate at Pew Research Center, where she oversees the Center’s annual study on global restrictions on religion. The conversation not only looked at the conclusions drawn from the report, but also critical issues related to religious freedom breaking down globally. Religious freedom violations and religion-related violence are at the root of many global crises. Many of the more than 65 million people who have been displaced as refugees or internally displaced persons have fled from religion related conflicts. Timothy Shah, Senior Director of the Religious Freedom Institute's South and Southeast Asia Action Team, delivered a private briefing for military leaders from the Near East and South Asia region on the critical role religious freedom plays in addressing the rising challenges posed by religion-related violence and terrorism. The Near East South Asia Center for Strategic Studies at National Defense University convened a seminar September 11-22, 2017 looking at the need to move beyond a "whole of government" approach to security and consider a "whole of society" approach. As Dr. Shah made clear in his presentation, drawing on a growing body of research, it is evident that religion-related violence is an increasing source of security concerns. There are two common approaches to this: 1) Greater restrictions on religion or 2) Greater religious freedom. The evidence makes clear that greater restrictions lead to an increase in religion-related violence both domestically and transnationally. The best environment for preventing and reducing violent extremism (both secular and religious) is an environment of real religious freedom and tolerance. Tom Farr will join Kristina Arriaga, Commissioner at U.S. Commission on International Religious Freedom, Judge Ken Starr, former Solicitor General, and Elyse Anderson, Congressional-Executive commission on China, for a conversation on international religious freedom and its critical role in protecting human dignity across the globe at American Enterprise Institute's 2017 Values & Capitalism Fall Summit. This unique gathering brings together leading voices from the Christian community for a one-day series of conversations on faith, public policy, and society. This year’s Summit will focus on the theme of human dignity and its implications for public policy and institutions of civil society, including conversations on the state of American communities, challenges in today’s workforce, international religious liberty, and Christian character and leadership. On October 4, Governor Sam Brownback of Kansas testified before the Senate Foreign Relations Committee as nominee to serve as Ambassador-at-Large for International Religious Freedom. RFI President Thomas Farr spoke with Travis Wussow, Vice President for Public Policy of the Ethics and Religious Liberty Commission, outside the Senate Foreign Relations Committee hearing room about Governor Brownback and the position of Ambassador-at-Large for International Religious Freedom. On June 26, the Supreme Court held 7-2 that the Missouri Department of Natural Resources violated the First Amendment’s free-exercise guarantee when it deemed Trinity Lutheran Church categorically ineligible to receive a grant under Missouri’s Scrap Tire Program simply because it is a church. Trinity Lutheran’s Child Learning Center ranked fifth among 44 competing applicants for grants to purchase playground surfaces made from recycled tires, improving playground safety and increasing recycling. Seven grants were awarded, but Trinity Lutheran’s application was denied. The Department of Natural Resources asserted this denial was required by a provision of the Missouri constitution directing that “no money shall ever be taken from the public treasury, directly or indirectly, in aid of any church, sect or denomination of religion.” This and similar provisions in 37 other states are known as Blaine Amendments. Is this likely to impact other religious entities, including those that are not strictly speaking a “church, sect or denomination of religion” such as faith-based hospitals, schools, or social-service providers (homeless shelters, elder-care homes, adoption providers, etc.)? What are the broader implications, if any, for American democracy, the free exercise of religion, and the constitutional ban on establishments of religion? By in large, the decision was hailed as a victory for religious liberty by proponents of accomodationist views of the religion clauses, and criticized as a further crumbling of the wall between church and state by those of the separationist school. Thus, the elephant in the room remains – whether these state law provisions are a legitimate basis for denying religious schools the right to participate in state educational voucher programs. Chief Justice Roberts was on pretty solid ground when he observed, in his opinion for the Court in the recent Trinity Lutheran case, that “[y]oungsters . . . often fall on the playground or tumble from the equipment. And when they do, the gravel can be unforgiving.” And, the foundation is no less firm for the Court’s conclusion that the First Amendment does not permit governments to discriminate against religious believers and organizations when distributing public benefits. September 15, 2017, Washington, D.C. (Religious Freedom Institute) — The Religious Freedom Institute calls on the United States and the international community to take immediate steps to stop the outrageous injustices the Burmese military is committing against the Muslim Rohingya and to ensure they are accorded their basic human rights, including their right to religious freedom. A brutal campaign of ethnic and religious cleansing carried out by the Burmese Army has victimized some 300,000 people from the predominantly Muslim Rohingya ethnic community in western Burma (Myanmar). In particular, the RFI calls on the UN Security Council to pass a resolution imposing a global arms embargo on Burma and calls on relevant countries to consider targeted sanctions against the Burmese military. In the past three weeks, hundreds have been killed by the Burmese Army, and the testimonies of refugees point to horrific crimes against humanity, including the burning of villages and shooting of women and children. The current crisis was precipitated by attacks on Burmese police posts by a small militant armed Rohingya group known as the Arakan Rohingya Salvation Army (ARSA). The Religious Freedom Institute (RFI) unequivocally condemns these attacks. However, “the Burma Army’s response to the attacks by ARSA has been grotesquely disproportionate,” observes Ambassador Bennett. While ARSA’s attacks cannot be justified, they were a predictable response to decades of persecution of the Rohingya. Research by RFI Senior Fellow Dr. Nilay Saiya, demonstrates that severe religious repression is the leading global cause of religion-related terrorism. Without an immediate end to the persecution of the Rohingya, a worsening cycle of religious militancy, Burmese military reprisals, and political instability may well occur and spread to neighboring countries. In 1982, Burma stripped the Rohingya of their citizenship, rendering them stateless and vulnerable to increasingly severe restrictions on their basic human rights. In 2012, major outbreaks of violence against the Rohingya began to occur, with the latest military campaign being the most severe and widespread. The Religious Freedom Institute urges the international community, particularly the United States, the United Kingdom, and their allies, the UN, and the Organization of Islamic Cooperation to act to stop further crimes against humanity. It also calls on the Government of Burma to open all parts of Rakhine State, where the atrocities are being committed, to unrestricted access by international humanitarian aid agencies, human rights monitors, and the media. At the same time, the Religious Freedom Institute calls on Pope Francis to use his visit to Burma in November to advocate forcefully for religious freedom, human dignity, and peace and reconciliation for all the peoples of Burma. "Under Caesar’s Sword" is a three-year, global research project that investigates how minority Christian communities respond to religious persecution. A team of scholars conducted in-depth field research into more than 25 countries where Christians suffer oppression and persecution because of their religious beliefs. Visit the Under Caesar's Sword website to find more information about the project and other resources including the report of findings: In Response to Persecution and documentary film: Under Caesar's Sword. August 15, 2017, Washington, D.C. (Religious Freedom Institute) — The Religious Freedom Institute welcomes the State Department’s 19th Annual Report on International Religious Freedom and applauds Secretary Tillerson and the Office of International Religious Freedom responsible for producing it. The Annual Report, required by the International Religious Freedom Act that President Bill Clinton signed into law, is sobering and disturbing. It catalogs the growing crisis of religious persecution that is causing immense human suffering. The report emphasizes that governments violently repress religious groups through blasphemy and apostasy laws, destruction and seizure of property, or imprisonment of religious leaders. The worst offenders include North Korea, Russia, Cuba, Iraq, Pakistan, Saudi Arabia, and Iran. Religious freedom should be central to our relations with these countries, and even with allies such as Turkey, where an American pastor, Andrew Brunson, remains in prison. Increasingly the most violent persecution has come from terrorist groups. The most visible threat has been the proliferation of ISIS and affiliated groups across the Middle East – and increasingly into Southeast Asia, Africa, and even into Europe and North America. “I am encouraged to see Secretary Tillerson reemphasize that ISIS is responsible for genocide against Yazidis, Christians, and Shia Muslims and that the Trump administration seeks to assist and protect them,” said Kent Hill, Executive Director of the Religious Freedom Institute. “The U.S. must ensure that humanitarian assistance is in fact reaching these genocide survivors. Beyond that, we must help them rebuild their homelands and create the religious and ethnic pluralism that can forestall the return of violent religious extremism,” said Hill. July 27, 2017, Washington, D.C. (Religious Freedom Institute) — The Religious Freedom Institute applauds the nomination of Governor and former U.S. Senator Sam Brownback as U.S. Ambassador-at-Large for International Religious Freedom, and calls upon the Senate to confirm him quickly. Governor Brownback’s wealth of experience, influence, and passion for religious liberty make him an outstanding choice to elevate international religious freedom to the front ranks of U.S. foreign policy, and to involve all U.S. foreign affairs agencies in that process. “With 16 years in Congress – including 14 in the U.S. Senate – Governor Brownback is well-known throughout Washington for his staunch commitment to religious freedom for people of all faiths around the globe,” said Tom Farr, president of the Washington-based Religious Freedom Institute. “He merits bipartisan support and swift confirmation from his former colleagues in the U.S. Senate.” Farr also directs Georgetown University’s Religious Freedom Research Project and served as the founding Director of the State Department’s Office of International Religious Freedom. “A growing body of social science research demonstrates that robust protections for religious freedom promote economic growth, increase political and social stability, and undermine violent religious extremism and terrorism,” said Religious Freedom Institute Senior Advisor Byron Johnson. “Under Governor Brownback’s leadership, U.S. international religious freedom policy can advance human rights and, at the same time, make substantial contributions to the national security of the United States at very low cost.” Johnson is Director of Baylor University’s Institute for Studies of Religion. He also directs RFI’s United States Action Team. The Ambassador-at-Large for International Religious Freedom coordinates international religious freedom policies across all U.S. agencies, is to report directly to the Secretary of State, and oversees the Office of International Religious Freedom at the U.S. State Department. Governor Brownback will be the fifth person to hold the position, succeeding Rabbi David Saperstein who vacated the position in January 2017. The United States Conference of Catholic Bishops celebrates its annual "Fortnight of Freedom" from June 21-July 4. 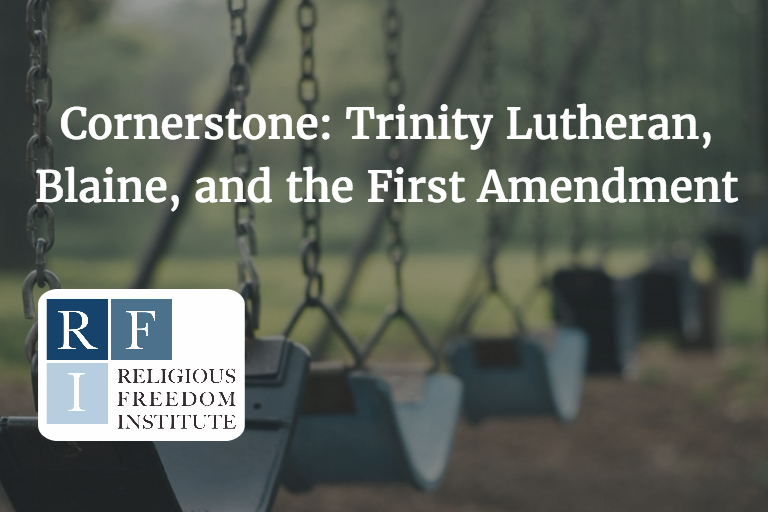 The annual event highlights the importance of defending religious freedom. In this short film, RFI President Thomas Farr joins other experts and church leaders to explain how the understanding of religious freedom for everyone is grounded in the dignity of every human being. June 07, 2017, Washington, D.C.— In response to ISIS genocide against Christians, Yazidis and other minorities, the House of Representatives yesterday passed unanimously the Iraq and Syria Relief and Accountability Act (H.R. 390), co-authored by Republican Chris Smith and Democrat Anna Eshoo. The Religious Freedom Institute (RFI) urges the Senate to move this bill, and the President to sign it, immediately. It will ensure that humanitarian assistance reaches the victims of genocide whose very survival is at risk. Sustaining these minority communities is a critical first step in enabling them to remain in their homelands. If Christians, Yazidis, Shabak, Kakai, Turkomen, Shi’a Muslims and other communities are not preserved in Iraq and Syria, the possibility that pluralism and stability might emerge in the future will be eliminated. A second critical step will be holding accountable those who have sought to destroy these communities. Last year both the U.S. Congress and the Department of State labeled as “genocide” the actions of ISIS. But U.S. aid has not gone systematically to genocide victims. H.R. 390 directs that humanitarian assistance be provided to those in greatest need, especially genocide survivors. It requires the U.S. to work with the most effective relief organizations, including faith-based entities. It supports criminal investigation into perpetrators of genocide, crimes against humanity, and war crimes in Iraq.